← Do Politics and Friendship Mix? That’s kind of a huge deal. I know people get really frustrated with super-political Facebook posts, but this is bipartisan. It’s just a reminder to VOTE. If you are eligible to vote in America, you gotta do it. You just must. And now there’s reason to believe that if you post on Facebook that you voted, you might be just the person to convince a friend to vote too. I find it fascinating that in a world where we’re inundated with political ads, presidential news, and phone calls from election volunteers, it’s the simple knowledge that a few of your pals voted that might be the most effective in getting people to the polls. And friends of friends are influenced as well. So the moral of this story: Tomorrow. Vote. Tell your friends you voted. Don’t be shy, be proud. Election day is awesome. People fought, some died, for the responsibility to vote. Who are we to shirk it? I’ll vote when and if someone worth voting for comes along. Until then, I’m not going to give legitimacy to a system I disapprove of by participating in it. Just because you CAN vote doesn’t mean you SHOULD. 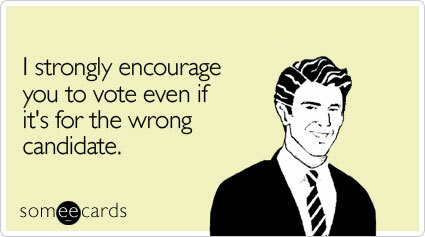 Even though the candidates aren’t ideal, I chose the ‘lesser of two evils’. I agree, people found and died for these rights, and I’m not going to disrespect that! There are more choices than the two primary candidates. Whenever I see people saying “I am not going to vote because I don’t approve/believe in” the system–I want to ask, well, how is the system ever going to change if you don’t cast your vote? I didn’t approve of/like either primary candidate enough to vote for them. I voted for one of the other options available on the ballot. I voted because my entire family has a military background, and who I am to blithely toss away a right that people died to give me? I am female, so on top of that, me not voting would be a waste of the women who campaigned, and fought in order to get women this right. It doesn’t matter who you vote for. You can write in any name you want, if you choose. What matters is you are there, and participating, and if you don’t like either primary, that you are making that known. Fifteen years ago, gay marriage was not legalized in ANY state. Neither was legalized marijuana. Yet last night, that vote passed in several states, changing things forever. There are enough people without voices, without interest, and who complain and never put themselves out there to BE the change they want to see. It starts with small steps–take them. I voted, and I posted it all over my Facebook all day, because I have friends who don’t, and I hoped they’d see it and take ten minutes out of their day to at least go see what it was about. If they don’t vote, they’re still my friends, but I am not as interested in hearing their complaints about things, as I feel they haven’t tried hard enough to change them. People can talk all day–action is what counts. And..now that I’ve left a great big ranty comment, I’m stepping off my soapbox. The same freedoms I participate in, others have the right to *not* participate in, and it;’s a personal choice. I liked your post, and wholeheartedly agree with it!